The shop – it’s bigger than it looks! We specialise in supplying organic produce, including wholefoods, vegetables, fruit, dairy and baked goods as well as household cleaning products, toiletries, and greetings cards. Many of our vegetables and dairy products are organic, and we also stock some non-organic products to make up the range. Several local smallholders and producers supply the shop regularly with fruit, vegetables and other products. Where possible we stock Fairtrade, ethically sound, low or no packaging products, and have an extensive range of foods that are ‘free-from’. Our carefully curated product range constantly amazes and delights, so do come and have a look. Our latest news: Click here for our facebook page or here for our ‘BrutonWholefoods’ instagram feed. Bruton is a fantastic place. People come from far and wide to visit Hauser and Wirth Somerset, a renowned contemporary art gallery, and the many attractions of the town. We have several top class eateries, pubs, a museum, post office, antique and gift shops, a chemist and a (part time) library. We’re not the only food shop: Bruton also has three convenience stores and a butchers shop. Great place to visit! We have now been in existence for sixteen years. 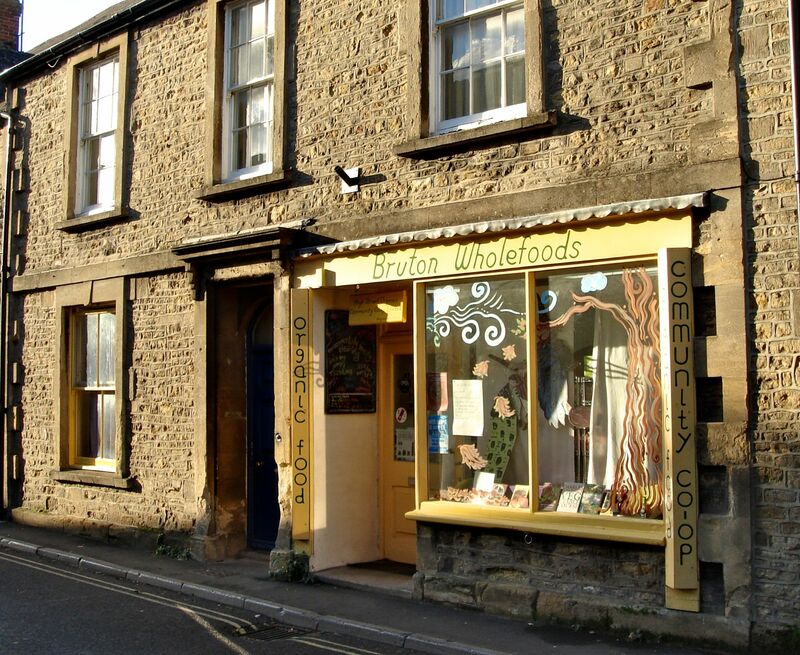 The shop was re-established as a community co-operative with the support of Somerset Food Links in 2002 and has a strong policy of sourcing local and organic produce. Customers are drawn from the local residents and visitors, and the shop has established a loyal customer base. We are a co-operative, and a registered Industrial and Provident Society. Although we have some (very lovely) paid staff, we continue to exist by the goodwill of our wonderful voluteers. well done with keeping BWF digital!